Calling Ambitious Young Filmmakers aged 18-23 for a unique opportunity to kick-start your career as a director. First Cut! Youth Film Festival, in partnership with Feel Good Lost, is delighted to announce that submissions are now open for the fourth edition of theYMVC – Youth Music Video Competition! The annual competition will once again offer five young emerging filmmakers the opportunity to create a music video under the mentorship of noted director Brendan Canty and producer David Lester Mooney (Feel Good Lost). YMVC is open nationally and invites applications NOW! The competition has gone from strength to strength each year – the quality of the work is nothing short of remarkable. 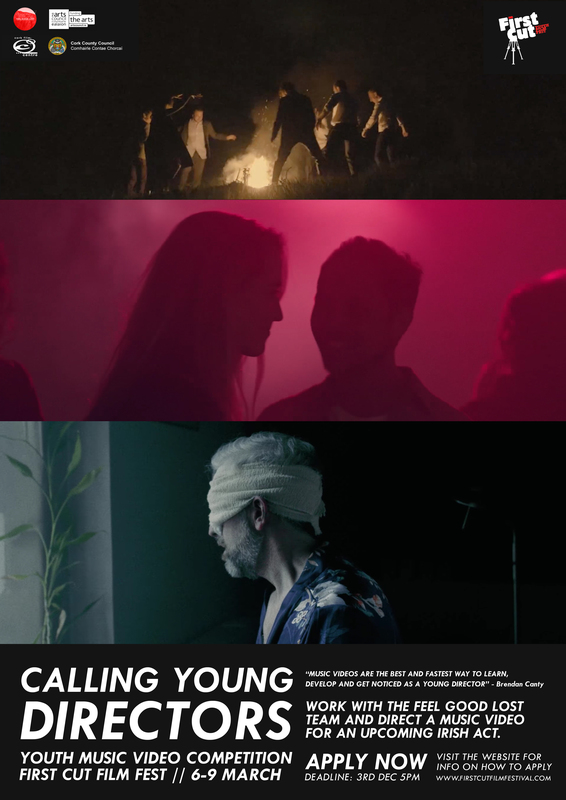 Last year’s winning video by Alexander Kuribayashi was selected as the official release for Ryan Vail’s Breaking Minds. Videos by the previous years’ winners were also released by Above Dat, The Academic, and Meltybrains. Past participants have also gone on to work in the industry. 2017 winner Lochlainn McKenna won Best Director at the Kinsale Sharks, while JJ Mc Dunphy and Andrew McConnell recently directed a stop motion video for a popular Japanese band. Christian Tierney has become Conor McGregor’s personal videographer. Write 200 words telling us about you, your background, and why you want to be a filmmaker. Send us a link to your best piece of work to-date. Include your email address, phone number and your date of birth. You can apply on your own or in pairs. The selected filmmakers will take part in a hands-on workshop with Feel Good Lost on Saturday December 15th in Cork. Using their extensive knowledge of the Irish music scene and network of musicians, Feel Good Lost arrange for five musical artists to submit a track for YMVC. Each track is carefully curated to a participating director based on their style. Briefs are tailor made for each director, with input from the artists. So far acts such as Ryan Vail, Le Galaxie, Tim Chadwick, Daithí, Meltybrains, Rusangano Family and The Academic have submitted tracks. Every style of music video is encouraged, be it narrative or experimental, live action or animation, or any combination of these. The process that each participating filmmaker will experience is identical to the process a professional filmmaker goes through in making a music video in the industry. Each filmmaker will submit a treatment document explaining their idea and, with on-going mentoring and support from Feel Good Lost, they make the video. In addition to making an amazing video, the competition helps directors build confidence and improve in areas of their work that need improving. Having my work analyzed by experienced professionals was intense but it absolutely pushed me to a higher level of professionalism and achievement. I am deeply grateful for the energy and support that Brendan and David put in this whole process. The workshop and festival was a major step in the quality of my work and confidence. All five videos will be screened at the 2018 First Cut! Festival on Saturday 9th March 2019. One stand-out filmmaker will be presented with an award. Once the video is finished, the artist will decide if they want to use it as the official video for their track. The goal is for the artist to get a music video that they are happy with, and for the director to get high quality video for their reel. But either way, it’s a win / win situation for everyone. First Cut! Youth Film Festival is an annual event that showcases and celebrates work by young filmmakers. It takes place at the Mall Arts Centre in Youghal, Co. Cork and is running March 6th – 9th, 2019. This vibrant festival is supported by the Arts Council, Cork County Council and Cork Film Centre. In 2016 First Cut! introduced a new focus on music video by creating YMVC with Feel Good Lost. This exciting and distinctive event within the festival continues to be a huge success.